Aubergine is one of those vegetables that is perfectly fine to eat if you have a sensitive gut. It is low in fermentable carbohydrates which means most people will find it easy to digest. 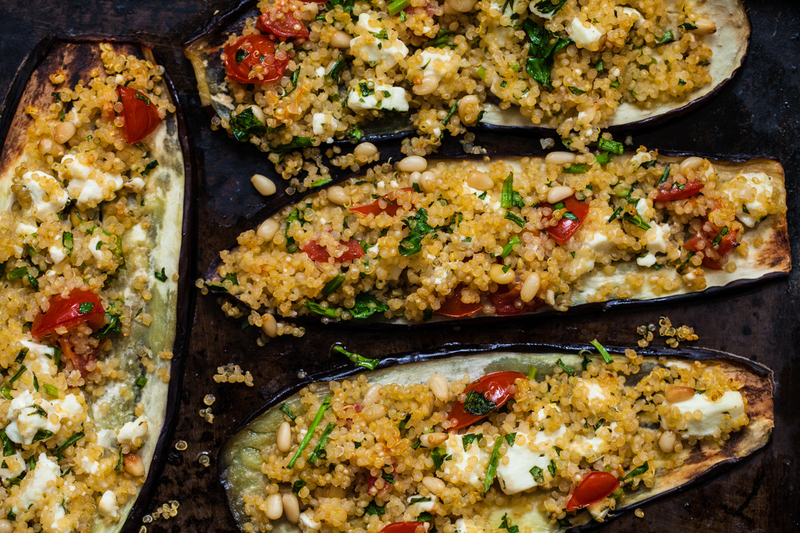 When aubergine is cooked well it has a silky, soft texture and delicate flavour which make it perfect for combining with crunchy pine nuts and delicate herbs such as parsley and chives. Whether to salt or not is a perennial question asked when I include aubergine in a recipe. I have tried both methods and I prefer to salt aubergine before baking. It draws out moisture and softens the flesh a little prior to cooking. But be sure to rinse well after you have salted aubergine for 15 minutes or a little longer.When little beads of moisture appear on the flesh of aubergine – it is ready to rinse. 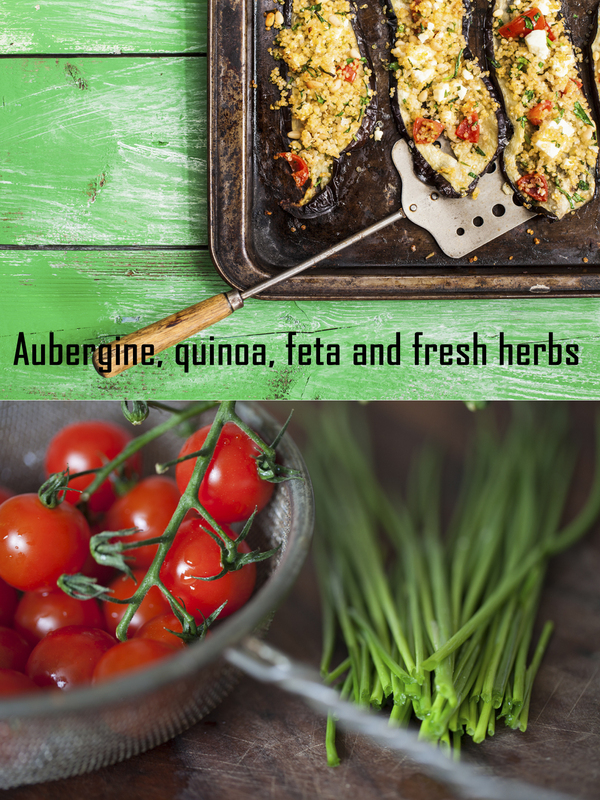 To cook aubergine – cut into slices 3cm thick and just wipe the flesh with a little olive oil and place on a baking sheet. Or you can dice into small cubes and dribble with a little olive oil. Cover the aubergine with a sheet of foil and place in an oven preheated to 200C for half an hour or until the flesh and skin of the aubergine is soft – test with a knife. Placing a cover over the aubergine keeps the moisture in and helps the aubergine to steam in its own juice. If you have a sensitive gut it is not a good idea to fry aubergine in oil as it acts like a sponge and the fat will upset the gut. After half an hour remove the foil and return the aubergine to the oven for a further five minutes just to caramelise slightly. Aubergine taste nicer when they begin to turn golden brown. Some cherry tomatoes contain moderate amounts of fructose and so I have only added a few to this recipe. Another thing to note is that 125g of Feta cheese is low in lactose and can be included in the list of cheese you can eat in moderation (it is still high in fat which can upset a sensitive gut). I will be cooking more recipes with quinoa which I love. It is gluten free and low in fermentable carbohydrates. It has a delicate flavour and is brilliant in salads and used as a topping as it is here. Preheat oven to 200°C/Gas mark 6. Cut the aubergines lengthways into 1.5cm thick strips and lay on a baking tray. Sprinkle with salt and leave for 15 minutes. Rinse the aubergine slices well under cold water and pat dry. Lightly oil a couple of large baking trays and the lay the aubergine slices in rows. Dribble with a little olive oil and place in the oven to cook until tender for about 15 minutes. Meanwhile place the quinoa in a pan with twice the volume of water and bring to the boil. Reduce the heat and simmer the quinoa for 8 minutes or until just tender to bite. Drain the quinoa and place in a bowl with the remaining ingredients. Season well. 25 Jul	This entry was written by Joan Ransley and published on July 25, 2014 at 1:48 pm. It’s filed under Dinner, Snack, Starter, Uncategorized and tagged aubergine, cherry tomato, feta cheese, gluten free, low FODMAP. Bookmark the permalink. Follow any comments here with the RSS feed for this post.